Grilled Chipotle Tofu Sandwich is a new twist on the blt. Spicy, healthy and yummy. Vegan, gluten free, dairy free. Feel free to use a vegan bun if desired. 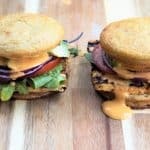 This bread is vegetarian and is from : https://lexiscleankitchen.com/the-ultimate-paleo-sandwich-rolls/. Slice tofu into 6 equal sized slices. Place tofu in shallow dish, and pour marinade over tofu, covering well. Refrigerate for 2 hours or longer. Place tofu on grill. Grill 5 minutes on each side or until you see grill marks. Drizzle marinade on tofu, leaving small amount for bread. Brush leftover marinade on sandwich bread top and bottom. Assemble sandwich with greens, tofu, onions, tomato, avocado. Serve.